Ruo-jian Chao walked slowly down the road in the early afternoon toward a device intricately made; a machine whose origins were of an alien design, one combining the majesty of clockwork mechanisms and the power of steam engines. Though Qin had both types of devices, they were never used together and never as weapons of war. The West had different sensibilities, it seemed to the old man. The device was a giant. It stood twice the height of a tall man and as wide as a man was tall. It moved on two legs, its gait before it stopped was surprisingly swift despite is mass and its wide feet managed to move through any terrain without difficulty. It was made of an orange metal which might be brass, except it was far too red. It wasn’t purely copper either because no verdigris addressed its joints or extremities, areas known to rust on machines made from copper. The machine had a unhealthy shine, something about its appearance drove the eye away from it, making you unable or unwilling to focus on it. The old man stopped and adjusted his chakra, his inner Qi energies and made a single handsign. Suddenly he could see the enchantments on the armor. A large rune was hidden in its ornate carvings, a powerful but primitive rune of misdirection. A warrior who trusted only his eyes might swing wide or aim too high as the rune altered their perception of the target. Despite its cunning design as a mighty weapon of war, it was little more than a blunt instrument, like a sledgehammer made for destroying rocks in a quarry. Hardly the right tool for a threat such as he. It was not a tool he would have to fear. He would flow like water around it. He approached within thirty yards and stopped. “I have no quarrel with thee. Go in peace. Return from whence you came and no more will be spoken of it, no honor lost.” Ruo-jian Chao’s accent was a bit thick but he thought it should be understandable to the drivers of the mechanism. He used the formal speech of the Western Kingdoms as he had learned when they came to this land so long ago. “It is our custom to reveal your name so that a warrior may tell your kin of your deeds in battle. You may call me Ruo-jian Chao. This province belongs to my family and in the absence of its garrison and guardians, I will send thee away or to thy doom.” The old man seemed to stand straighter, his cloak which he had kept over his slumped shoulders, fell away, revealing a thin shirt and a powerful chest. His arms and shoulders were covered in scars. His legs boasted an equal number of such scars and his brown skin was lined like a worn parchment. His wide and shoeless feet slid into the grass, feeling the earth and knowing its density, its resistance and how it would aid or impede his movement. The quiver of arrows were low-slung so they did not interfere as his cloak fell away. “We have no such custom where we come from, but know this: We are not alone. You mistook our statement. Behold.” Two dozen men appeared as if they stepped from the shadows. A rune appeared on their armor for only a moment as they appeared, cloaked by magic. Each wore the livery of the Clockwork King, a great gear, a hammer and a sword on their tabard. They were lightly armed, a hardened leather-like armor, much like a fish’s scales. They wore a strange mask similar to the clockwork device’s face, their emotions hidden from view. The archers tightened their draw. The swordsman waited until the first volley would incapacitate their foe. The Clockwork raised its right hand and a small cannon protruded from its palm. 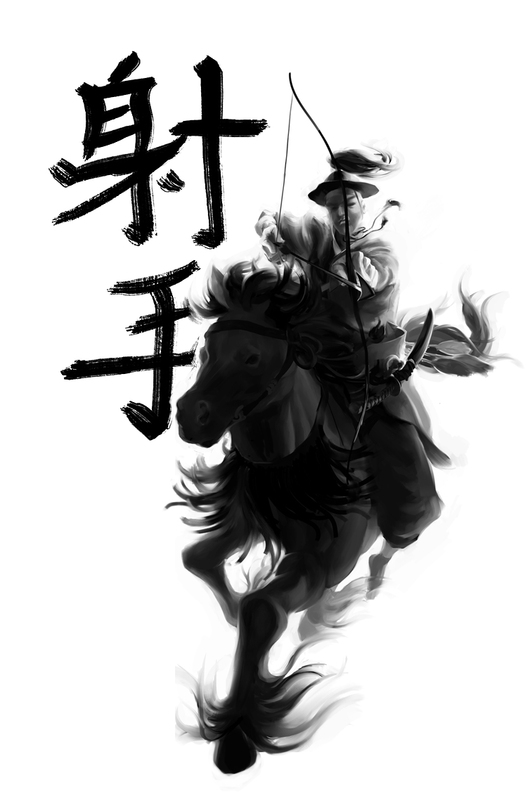 “So be it.” Ruo-jian Chao launched his first arrow before anyone saw him move. The Clockwork device fired its cannon a split second after he loosed his arrow. Dà Gōng Nán sang a song of power. The release of the bowstring gave forth a musical note which caused everyone who heard it to hesitate, such was the power of the vibration from the bow. Its first arrow penetrated the great cannon and when it fired, the arm exploded from within. Shrapnel from the explosion caught two of the swordsmen closest to it and blew them from their feet. Their torn bodies were still landing before Dà Gōng Nán sang again. 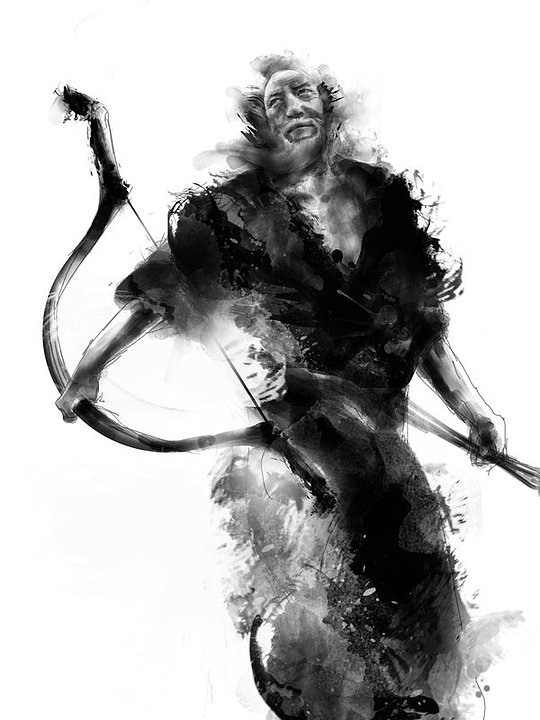 The archer farthest from Ruo-Jian flew from his feet as the arrow caught him in his eye, his turning head caused his arrow to be loosed and strike another swordsman in the back. Spinning from his shooting position, he heard seven arrows pass where he was a moment ago. Two archers held their shot. The swordsman were fast, two of them closed the old man and their swords were flashing slivers of light as they attempted to carve Ruo-jian apart. Normally he would have had his own sword and they would already be dead. Instead he disarmed one by stepping inside of his swing and turned him around into his companion who would stab him. With the short sword released by the dying man, Ruo-jian spun and stabbed the second swordsman in the neck. The release of two arrows. The old man dropped as the two swordsman were now pinned together by the remaining arrows. Breath. Roll. Throw. The long knife flashed into the mask of an oncoming swordsman. Ruo-jian grabbed his body as a shield when the next volley of arrows flew. Four found their mark in the swordsman’s flesh. One nicked Ruo-jian as he spun away. The last archer was slow in his firing and shot after his fellows. The old man plucked his arrow from the air and flipping it with his fingertips, restrung and fired before the archer had realized he missed. They were moving slower. More disorganized. Not used to having to work. What’s that? A click preceded the explosion of the ground front of him and only his quick reflexes spared him from the worst of the damage. The other swordsmen who were closing on Ruo-jian were knocked down and away from the old man who had landed in the tall grass at the edge of the road. Only one swordsman remained on his feet as the second arm cannon of the Clockwork fired into the midst of the attacking soldiers. Monstrous! They would kill their own to destroy an enemy. Face down, Ruo-jian had held on to his bow, the mighty Dà Gōng Nán. As he brought the weapon to bear on the Clockwork device, it had opened two more gun ports on its chest plate. He would have to choose. Before he could make the shot, the Clockwork device exploded as the one of the two bolts from the ballista tore through one of its legs. Realizing the Clockwork would now spin to the left, its aim would be off. It’s chest cannons roared as its two shells streaked off into the distance. The old warrior didn’t have time to wonder where they might land. Ruo-jian sprinted and shot at one of the remaining archers who had maintained his presence of mind and was shooting at the same time. Their arrows passed each other in flight. The old man shot better. Taking the younger bowman in the chest his arrow went completely through him. Ruo-jian was already taking his next shot. The now dead archer, however, did hit his mark and the old man’s thigh also had an arrow protruding from it. Their bows were less powerful and lacked penetrating power. Dà Gōng Nán sang again making one more shot and taking one more life before its bowstring broke, damaged by shrapnel in the explosion. Ruo-jian watched as the remaining five archers sensing a momentary advantage rallied to fire again. The lone swordsman looking at his stunned and downed fellows hesitated, hoping the archers might take the day. Ruo-jian held Dà Gōng Nán out in front of him and with his free hand made a rapid handsign. He planted the end of the bow in the ground as the archers shot collectively. Dà Gōng Nán sprouted five arrows, seemingly drawing the arrows to it. Ruo-jian was already on the move, scooping up a longsword and short sword as he ran toward the archers. Slowing down. Chakra disrupted by arrow. I need to end this now or I’m finished. The old man could feel his jutsu’s failing, but he only needed a few more seconds. The short sword was thrown with speed and accuracy taking out the archer closest to him. Using the other longsword he parried two of the arrows as the third caught him in is upper arm, the fourth flew wide and that archer was the one closest to him. A single slash of his sword and his head was gone. Ruo-jian turned to face the remaining three archers and single swordsman. Blood flowed down his face from a shrapnel injury, multiple cuts across his upper body as well as the two arrows made him appear more monster than man. For a second the four of them stood motionless, each evaluating the other. The crash of the Clockwork device as it toppled decided the battle. The last four fled without looking back. Ruo-jian watched as they fled down the road. Then his chakra ran out and he collapsed where he stood. “Right here. We couldn’t remove the arrows.” Chen demonstrated by pulling each arrow as hard as he could. “There’s a jutsu on the bow, so you won’t be able to pull them out. Only I could. The arrow shield jutsu made sure no arrow would hit me as long as I held Dà Gōng Nán. “If no one could hit you as long as you were using the jutsu, then why didn’t you carry it with you to protect you from their arrows?” Chen looked at his grandfather with a look of profound confusion. The old man reached over and grabbed one of the Clockwork archer’s bows and quivers. He hobbled away from his grandson who was still holding Dà Gōng Nán. He fired an arrow at the boy. 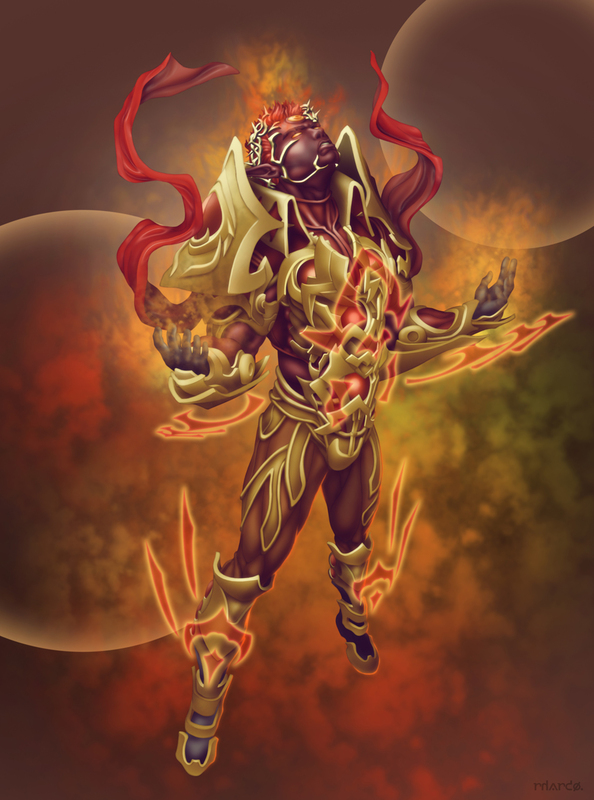 Chen reflexively held the ancient weapon in front of him. The arrow found itself embedded in the bow. “Try to move with the bow in your hand,” Ruo-jian directed. Ruo-jian fired again as Chen tried to take a step. The bow caught the arrow again and Chen had not moved. Not a single step. Chen hoisted his grandfather onto his back and walked to the still smoking wreckage of the Clockwork device. His grandfather felt lighter and more frail. His old body was cold and trembling uncontrollably; the price of using so much chakra at his age. He would probably sleep for a week. The two swordsman sat with their heads slumped forward and unmoving. Chen put Ruo-jian down next to the men who lifted their masked faces and appeared startled as the still bloody and bandaged old man sat before them. Trying to use the informal speech of the West, Ruo-jian spoke to the two soldiers, “This battle is now over. We offer you a chance at peace with us, or at least a return to your people.” Ruo-jian invoked the ritual of hospitality with reluctance. He had seen these people in battle and knew they would never keep their word as a native of Qin might. “We refuse your offer. Our God-King will come to this forsaken land and cleanse it. He will build our factories of war with your bones as our fuel. Your blood will be used to drive our infernal devices giving them the life they need to continue our conquest of your land. Your people are nothing before our might.” The last statement trailed off as if he were embarrassed he had made it. “My grandfather destroyed your machine and your men alone. He is nearly seventy summers old. Your might has not impressed us much.” Chen’s thoughts left his lips before he considered them seriously. His grandfather’s stern and reproving look said as much. “Tell us of your advancing army, how soon before they arrive here?” Ruo-jian had no hope they would tell him anything useful. If there was anyone else coming down the road soon, he was in no shape to contend with it. The ache went all the way to his bones. Together in unison, they shouted: “We are from the Machine by the Machine and of the Machine. We return to the Machine. All hail the Clockwork!” Then the two soldiers began to scream as smoke rose from inside their armor and masks. Their bodies shook violently as they began to smolder and burst into flame. Suddenly all of the soldiers bodies did the same thing, exploding into flame. The farmers moved away in horror as the bodies of their enemies caught on fire. In the distance, four distinct screams echoed off the White Mountains, agonized screams which carried on the wind and too eventually stopped. As the fires died, Ruo-jian took off one of their masks. The seared flesh peeled away from the bone beneath the mask. The stink of burning flesh rose into the late afternoon air. My grandfather was a doddering old fool but he knew how to tell a good tale. I had heard this one so many times, even when I was out of earshot, his telling of this particular tall tale came back to me, in my inner ear. I turned around to see the White Mountains and the brutal scars which adorned her sides. Trees grew halfway to the summit before the mountains became inhospitable, only ice and snow covered the rest. There were three gouges in the side of the mountain, large even from this distance, as if the mountain had been struck by a one of the Clockwork King’s bombs. Up close, it might take half a day to cross one of the scarred regions. Nothing natural grew in those places now. My grandfather would sit and look out over the field with a short bow helping to protect us against predators while we farmed. Our county lost our last dog to the dire wolves which prowled the kingdom since the Clockwork King’s armies began their assault against Qin. The youngest who were too small to farm would sit with him and listen to his stories about early Qin and our southern border neighbors Wester, named after their greatest invader conqueror King Wester. My grandfather was not nearly as humble as my father, Wu Chao, thought he should be. Perhaps it comes from grandfather having once been a great warrior. He was called Ruo-jian Chao, the Unsurpassed Blade, once known for his mastery of the sword and the great longbows of the Southern Provinces. But what battle does not take from a man, old age eventually does. Closer to seventy summers than sixty, he had grown infirm from a back injury he acquired during one of our many border wars. He could walk but it was agony for him, even using a cane brought him no relief. I carried him to the edge of the field into a small covered tower to let him keep his eyes on the children. I was no warrior but a scholar like my father. This disappointed my grandfather greatly. He insisted I be trained in the basic arts of war. He honed my body’s strength and I secretly cheered even as I outwardly chaffed being taken from my studies. I gained the best of two worlds. I enjoyed the fact I could carry him to the field without struggle or strain. He insisted on being allowed to stand watch and telling stories to the youngest of the children which kept them from underfoot until they could help with the farming chores. Though he could not stand for long, his arms were still strong enough to choke a wolf to death, barehanded. His archery, even with the inferior short bow, was never less than perfection itself. My father, thanks to his own craft and my grandfather’s service held this land on the edge of the kingdom with a small garrison to help keep the farming resources flowing into the empire. My father was always fond of saying, “Shen, one day, this will all be yours. All I ask is you be ready for it.” The life of a farmer was not one I sought but came to me anyway. “Their skin was tougher than the strongest iron and as black as the midnight coal. Up close, their scales were pitch black and cast no reflection at all. These were creatures designed to hide in dark places, only their gleaming golden eyes would give them away. They were thought to be so dark, men were known to take cover and stand right next to one without knowing, thinking they had found a shadow perfect for the waiting. A yellow glow and a final chomp was all that was left of them.” The children laughed at his overemphasis on the sound effects of his story. Since the Clockwork Wars began nearly thirty years ago, they ravaged the kingdoms and provinces to the north and east. Recently, King Wester’s family and the bordering forest of the Westerwood have made overtures of peace and my father and the other elders have been eager to entertain them, since both sides have suffered great losses. Our province which encompasses my father’s land and the lands of Wester, south of us have begun to see more of the forces from the once distant war creeping ever closer to home. “What about at night, noish-pa, did the Great Worms hunt at night?” One of the children piped up at the appropriate time. “Noish-pa, there are no such things as the Great Wyms anymore, only their much smaller cousins. You told us there hadn’t been a dragon seen even in the forest of Westerwood for thirty summers.” One of the girls from a neighboring farm, Pa-mel, shouted as she dropped off a bundle of rice and took a sip of water in the shade. “Brrrrr.” the children squeal in unison. “Would one of you youngsters bring your noish-pa something to parch an old man’s throat?” As the youngster hopped down from the covered overlook built for archers, Grandfather picked up his bow and moved the arrows in between his knees. His face lost the smile we had come to expect from him. Then I heard it too. A whistle in the distance, the whistle of a steam engine, something large and mobile. The whistling sound grew steadily closer. As it crested the hill, we could see it in the distance; grey and brown with a stilted gait. It was a clockwork machine! There weren’t supposed to be any of their machine armies this far south. The machine moved slowly, clumsily, not like anything my father or grandfather described. “It’s damaged. That makes it twice as dangerous. That device usually has at least two men with it. But it could support two dozen. I don’t see anyone but that could mean it is just being used to draw fire while their soldiers steal and burn food supplies. Shen, bring me Dà Gōng Nán and her arrows from below. Then get everyone out of the field. Pa-mel, you go with Shen and the other men to arm the two ballista at the edge of the field. Wait for my signal. I will stop it where you have the best chance at a shot. “Grandfather, how will you get to the machine?” He stood up at the top of the tower and made some rapid handsigns. Signs he had never taught me. Then he walked to the edge of the tower and jumped to the ground. Qi mastery was not something to be taken lightly. He explained to me it should be used only in emergencies. This must qualify. “I’ll walk, you take care of everyone else.” Taking Dà Gōng Nán from me, he turned and ambled down toward the road to face the deadly mechanism. Alone.